Policy/Quality | Specialverktyg - Vi utvecklar, konstruerar och tillverkar skärande specialverktyg och detaljer till verkstadsindustrin i Norden. Specialverktyg’s most important competitive advantage is high quality and total zero tolerance. This means that all design and production shall be based on the requirements of customers , communities and employees are demanding. Our working environment is characterized by respect and trust for the individual as well as being safe and stimulating. A good working environment means not only that the risk of injury is minimized, but also that the staff can feel comfort and make progress at work. The working climate and psychosocial issues must be paid great attention so that problems can be detected early and be addressed. The company maintain a contact with staff who are affected by illness or will be long-term absent for other reasons. Likewise, the company is actively involved in the resulting work adaptation and rehabilitation matters. Each employee has a personal responsibility for their safety in their daily work. Everyone is supposed to follow instructions and procedures and to be alert at and report possible detected deficiencies/hazards to their closest supervisor. Specialverktyg’s most important competitive advantage is high quality and a total zero tolerance. This means that all the design and production shall be based on the requirements that customers, community and employees is demanding . The company applies a comprehensive view to the environment. We will promote recycling and development in environmental work where it is technically feasible, economically viable and with respect to the environmental benefits. Existing legislation should be seen as a minimum requirement. 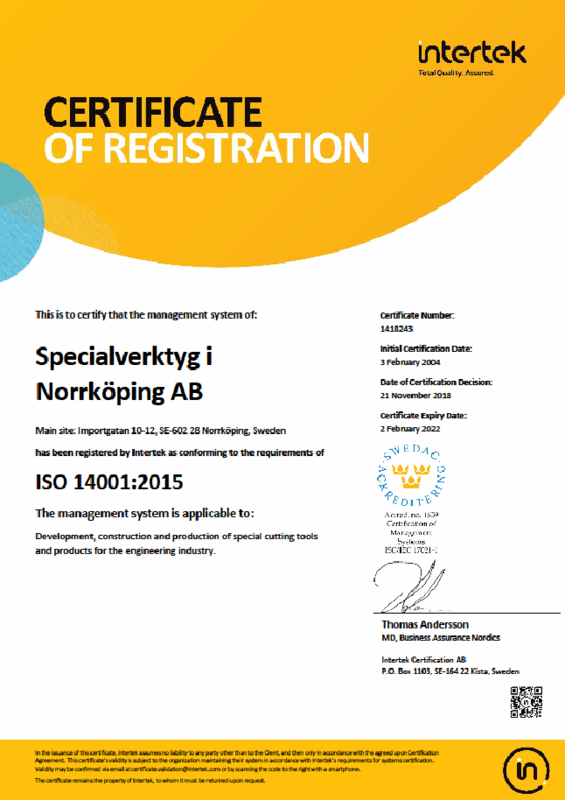 Specialverktyg i Norrköping AB are certified by ISO 9001 and ISO 14001. Do you want to print the certificates or save them? Just click at the certificate that you want to view.